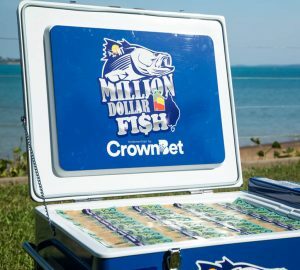 The Northern Territory will be the place to fish from October this year (2016), with possibly the world’s largest fish lottery kicking off for a second season. Season 1 of Million Dollar Fish saw 10 of 75 tagged barramundi caught. The high recapture rate proved the cynics wrong … the fish did not just disappear after being tagged. One bloke even caught two of the tagged fish, worth $20,000! There were 74 fish worth $10,000 and a 75th was worth $1 million. Fortunately, barramundi are a tough fish that survive tag and release well. More to the point … will fishermen survive the heat from October! Morning and afternoon fishing will be the name of the game. Season 2 will see 100 of the tagged fish available for capture, 25 more than Season 1. The fish are released right across the Top End. Good recaptures rates were reported in Darwin Harbour, but fishos will also have a good chance at the Daly River, Corroboree Billabong, Roper River and Bynoe Harbour, among other places. Just get the best northern info, and fish hard. The info is in the North Australian FISH FINDER maps and GPS data book, now in its 11th edition.